Turtle Lake, Wisconsin, has weathered a century of ups and downs with the farm economy. Now as the food processing pioneer PURIS revives one of the village’s oldest facilities, Turtle Lake is ground zero for the future for the American food system. Farming is woven into the fabric of small communities across the Midwest. Towns like Turtle Lake, Wisconsin, Oskaloosa, Iowa, Randolph, Minnesota, Harrold, South Dakota, and Wilmington, Illinois play an essential, yet often invisible, role in making food that nourishes people around the world. As the global economy and American diets shift, so, too, do the fortunes of business in these communities. Successive generations of family-owned companies have opened, closed, and retooled for the next phase in a process that reinvents not just the business but the community as a whole. Such a reinvention is now underway in Turtle Lake. With the arrival of PURIS, the town’s historic creamery is ramping up to build a smarter, safer, more sustainable food system—a promise that flows not from milk, but from organic pea protein. A HISTORY OF AG ENTREPRENEURSHIP. In 1902, local dairy farmers created a co-operative creamery association in Turtle Lake. With an investment of $5,000, a substantial sum at the time, the farmers built one of the region’s first dairy processing facilities and incorporated in 1916. 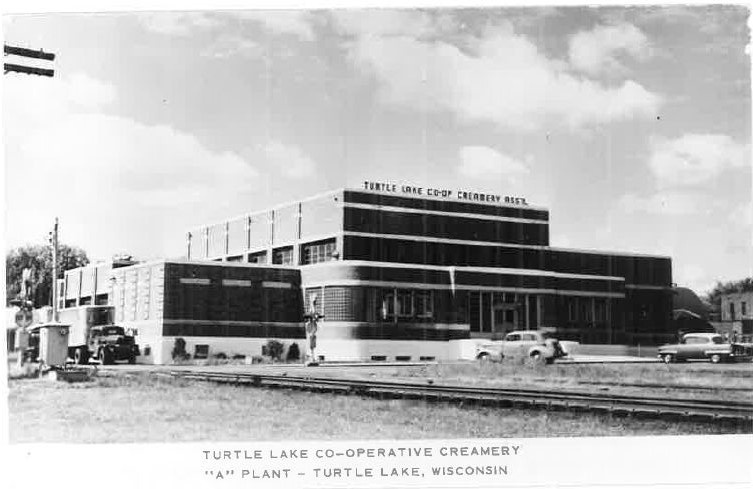 After competitive pressures forced the Turtle Lake association to sell, the creamery was purchased by a succession of owners who would shepherd the facility through its Dairy State heyday. By the 1950’s, a new facility had been built next door to the original and was acclaimed by experts as the most modern creamery in the world and drew record crowds to see its expansion. But as the price and demand for dairy products declined, the creamery that had employed generations of workers in Turtle Lake finally closed up shop. A second life as a soy processing facility failed to turn the tide and the facility went dormant in the late 2010s. FROM WISCONSIN TO THE WORLD. Where some see Farm Belt relics rusting away, others see opportunity. In 2011, one company identified Turtle Lake, a town of just over 1,000 people, as ground zero for an ag innovation revival. That company, PURIS, was founded in Iowa in 1985 by geneticist Jerry Lorenzen. Lorenzen envisioned a World Food System—uniting organic and non-GMO seed genetics, sustainably grown crops, and ingredient manufacturing—that could usher in widespread adoption of plant-based foods. Turtle Lake’s former creamery is a critical piece of PURIS’s end-to-end production system. Their process begins with proprietary seed that grows certified organic crops on farms across the Midwest. PURIS converts these crops into powder in their Iowa facility. That powder moves on to Turtle Lake where it’s separated using clean processes to extract high-quality ingredients. PURIS has invested over $50 million in the plant as part of a five-year investment strategy. Recently, PURIS struck a partnership with Cargill, one of the world’s largest food companies, to further fuel this expansion of plant-based proteins. The plant’s production capacity has quadrupled and is on course to produce millions of pounds of ingredients annually. That’s how Turtle Lake becomes the launchpad for organic foods enjoyed by people across the U.S. and around the world! With unknown risks from genetically modified foods and organic imports, the safety and sustainability of the products we eat isn’t always certain. PURIS is working to restore confidence in our food supply. The company sources only the highest-quality organic plants, including yellow field peas and other nutrition-rich pulses, to extract 100% of the nutrition from each: protein, starch, sugar, fiber and more. That means less waste and more peace of mind for consumers. You won’t find PURIS-branded products on grocery shelves. Instead, food makers use the company’s ingredients to create an astonishing array of finished foods. The company’s long list of partners include a top producer of performance-enhancing protein shakes and powders and one of the world’s leading energy bar makers. How do you know you’re buying a pea protein product with PURIS ingredients? If it’s made in the USA, then it’s powered by PURIS. GROWING EMPLOYEES AS WELL AS A BUSINESS. As a family-owned company, PURIS knows its interests are entwined with the town’s. Without a capable and motivated workforce in Turtle Lake, the company can’t achieve its ambitious goals. So PURIS is giving employees and their families every opportunity to grow. “We are making moves knowing full well that we can bring the community up with us,” says PURIS CMO Jon Getzinger. What does opportunity look like at PURIS? 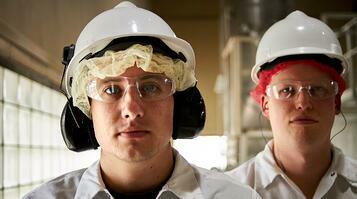 Their Turtle Lake plant is one of the country’s most advanced food production facilities. Employees learn state-of-the-art manufacturing skills across a range of technical levels and abilities. Worker development is in the company’s DNA, building a team where everyone steps up, owns their career and improves the world in the process. What’s more, by providing nearly 100 workers with high-quality jobs, PURIS is giving families a future in the town that was hard to imagine just 10 years ago. With topline revenue growing 50% year over year, the fortunes of the company and the community appear bright. This early success is only the beginning. “The plant-based food industry is still in its infancy, and we are at the forefront of its development,” says Lorenzen. “We need people with us who are hungry to see growth and want to help lead it.” If you want to be apart of a team where you matter, click here. In that way, the next chapter of the ag economy builds on a legacy of innovation and entrepreneurship that began in Turtle Lake over a century ago. Instead of something from a nostalgic past, the state’s small towns and the industries that sustain them are part of a vibrant future—creating a healthier world at home and far beyond.